After our old Boston Terrier passed away, we started taking Wiley everywhere with us because we were worried about her being lonely. Then, when we adopted New Max we were really excited by the idea of showing this poor abused rescue dog what a good home is like. 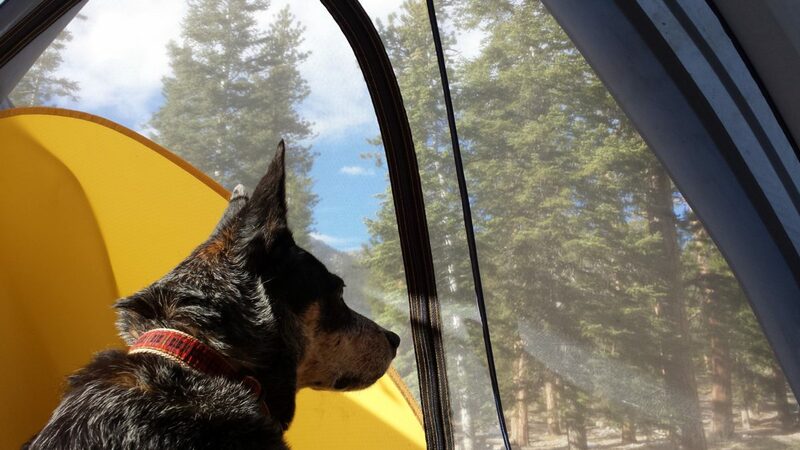 So now we travel with two cattledogs who love the outdoors and take on any adventure we throw their way. 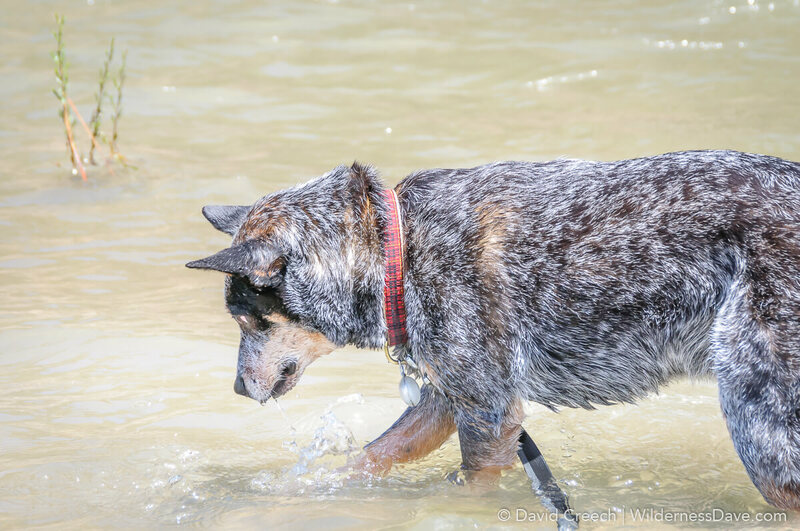 Taking our cattledogs on summer adventures in fun outdoor areas is a big focus for us as traveling dog owners. 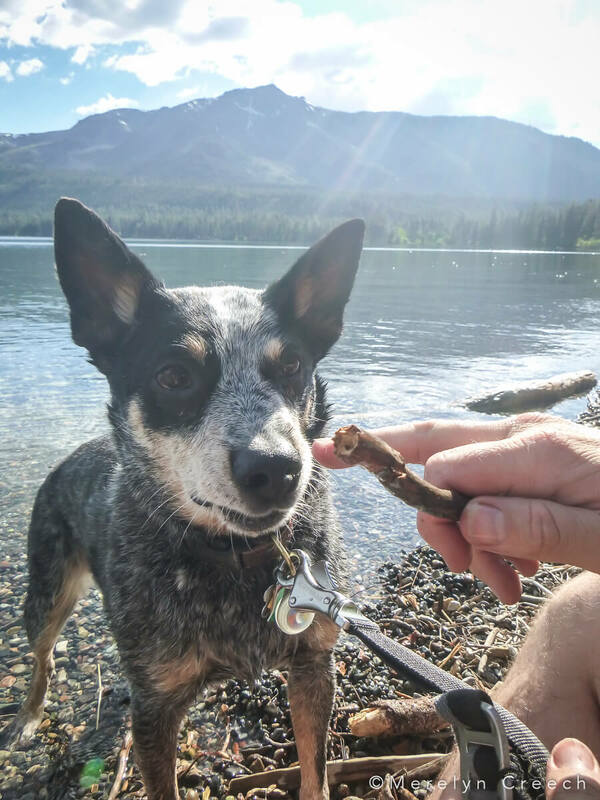 We often specifically plan trips around dog friendly locations and climates, which in the summer means getting out of Arizona. Every summer we take a trip to Lake Tahoe to get away from the desert heat, soak up some mountain air and enjoy the beautiful lake scenery. 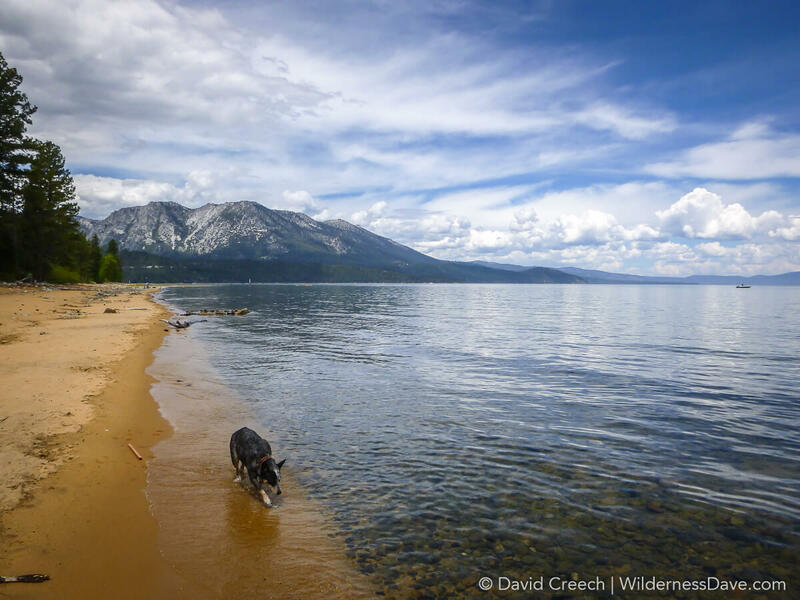 Lake Tahoe can be challenging with dogs (it’s not a super dog friendly place), but if you do a little looking around and plan accordingly it’s manageable. We had been debating whether or not we would do the trip this year, and if we really wanted to take the dogs. 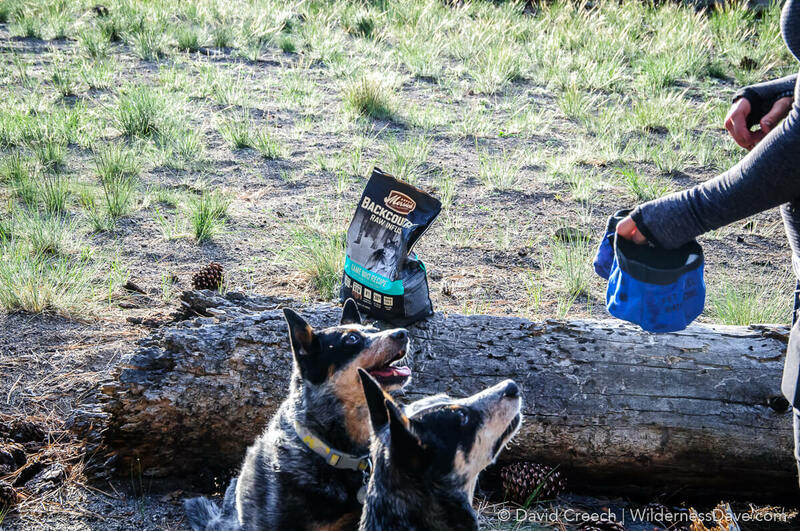 Then we were contacted by Merrick Pet Care about being a part of their Backcountry Dog Food ambassador program. As part of the sponsorship not only did Max and Wiley get to try out their new food (which they really love) but Merrick also set us up with some extra funds to take the dogs on a trip. WARNING: Ridiculously adorable dog pictures ahead, totally NSFW if you actually want to be productive. We took Wiley to Lake Tahoe on Merelyn’s birthday last year and had a great time. Wiley did really well hiking and swimming and was surprisingly quick at learning how to Paddleboard. 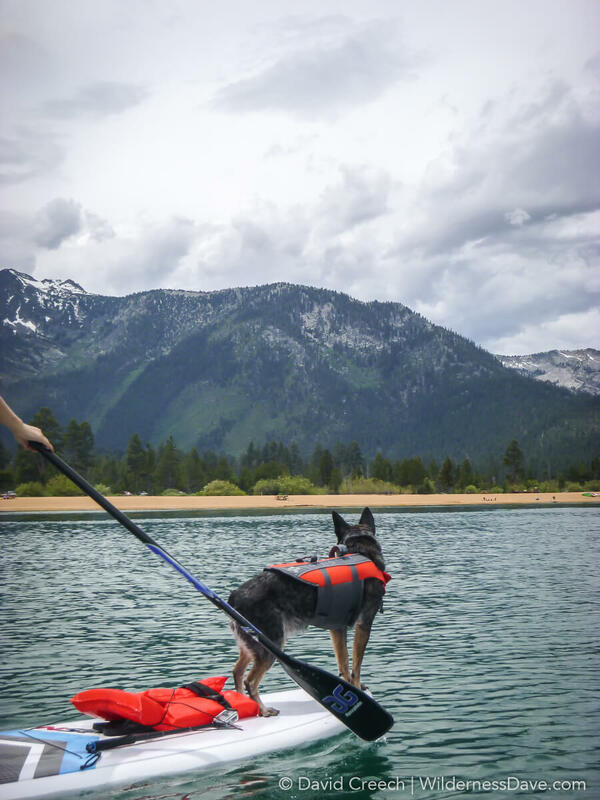 Ever since bringing New Max into our family, we’ve wanted to get him out to Tahoe as well and see how he would do. It’s about 13 hours of road time between here and Lake Tahoe, mostly through the lower deserts of Nevada. There are not a lot of good places to stop with the dogs because the summer heat can be brutal. So our trip up north started with WAY too much car time, more than Max has had to deal with. He made sure his boredom was well documented. Overall he did great, eventually settling in for the long trip but he took advantage of every opportunity to get out of that car. His relationship with the Car has been changed forever. 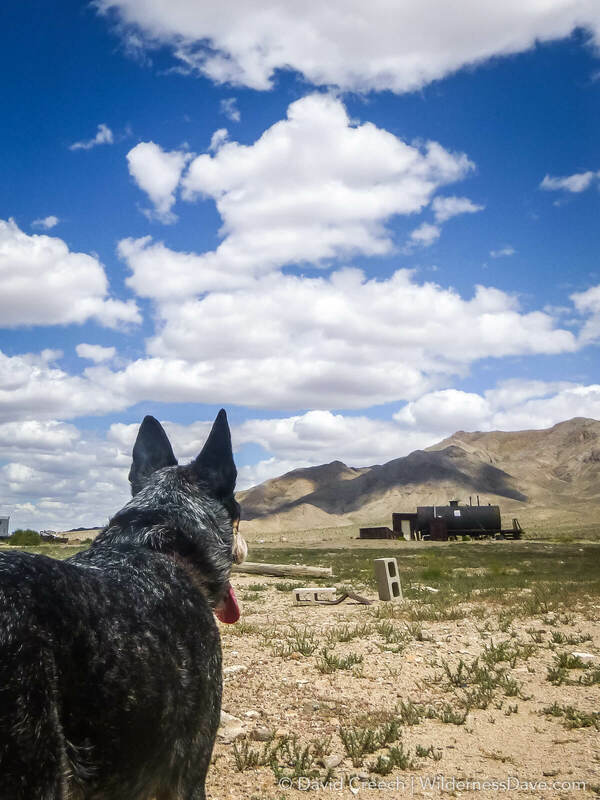 One of our few Day 1 stops to let our two and four legged passengers stretch their collective limbs was a small ghost town in the Nevada desert. Gold Point is a working town with a population of a couple dozen semi-permanent residents. Even so, there were no people to be seen while we were there and we had the entire old western mining town to ourselves. Luckily it wasn’t too terribly warm there as we were starting to gain some elevation, so the dogs got to walk around with us for a while sniffing at old wreckage, cows skulls, dead snakes and abandoned buildings all while trying to avoid random bits of broken glass. There were a couple of old rickety houses they seemed especially interested in sniffing around the front porch and front doors, but I’m sure the only scent they were getting was rodent. After a LONG, less than exciting day in the car we finally made camp just above Mono Lake at the edge of treeline. Wiley and Max were overjoyed at the prospect of some actual freedom and immediately set about exploring their new territory. The gnats were pretty thick and the longer we hung out, the thicker they got. We all got doused with a generous dose of bug spray (pet friendly stuff) and tried to go about our business cooking dinner, setting up the tent and sniffing random logs (we each had a job to do). The dogs got their Backcountry dinner then we took them for a nice walk to burn off some energy letting the dogs sniff and explore on their own while we waited for sunset to color the darkening sky. Sunset was no disappointment and both of the dogs seemed very at home following me as I wandered around in the fading light with my camera. I really enjoy watching our dogs play with their natural instincts in nature. Without the restrictions of home, civilization and city life they get to experience being free for a while. They get to play, run, jump, sniff, scratch and chase without hearing “NO” all the time and we’ve found they’re both really good about coming back to us with not much more than a little whistle or name call. Wiley was finally showing that relaxed, contented look she gets when we travel and spend time outdoors, we’ve come to refer to it as Wiley’s “Vacation Eyes”. Vacation Eyes are the sure sign that we are finally settled in to a trip and doing things right, we adore Wiley’s Vacation Eyes. As much fun as we all had at camp, the bugs were still thick and we noticed both dogs were taking a pretty good beating around their ears. So we socked in early and hid in the tent. Max has grown very fond of the tent and will often ask to be let in early…probably to claim HIS spot before the rest of us get in there. The next morning we finally reached Lake Tahoe and the very first thing we did was get the dogs on one of the few dog friendly beaches. Reagan Beach is where Merelyn and I got married and it also happens to be a decent little dog friendly beach, so that’s where Max got his first introduction to Lake Tahoe. Being a rescue, we have no idea if he’s ever even seen water like that, so expansive you can’t see the other side. He definitely acted like it was a new thing to him and he was bounding through the small waves joyfully and barking at us to play with him (as he often does when we aren’t playing right). We set up camp at Fallen Leaf Lake Campground and then hiked up the road to check out Fallen Leaf Lake itself. Colder water, rock beaches and small driftwood sticks everywhere made this lake a bit different than Tahoe. 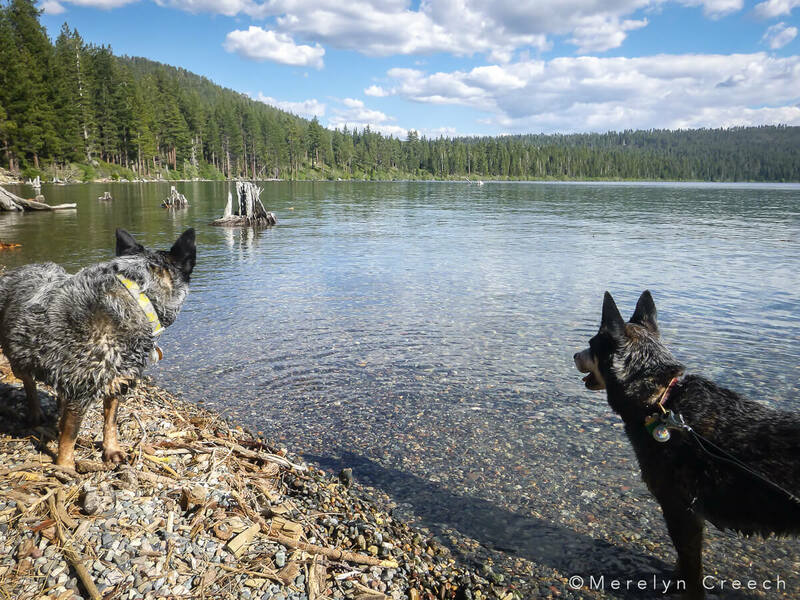 The dogs had less interest in swimming and running than chewing every piece of wood they could get their mouths on. Max has a toy fixation that we avoid by not having a lot of toys around for him, we have to keep him occupied in other ways. But this was an entire beach covered in tasty toys and he was a little out of his mind. Every time I would pick up a stick, or take one from him, he would target on it with laser focus and bark at me if I didn’t throw it soon enough. He gets a little mouthy at times if you’re not playing the way he wants you to. 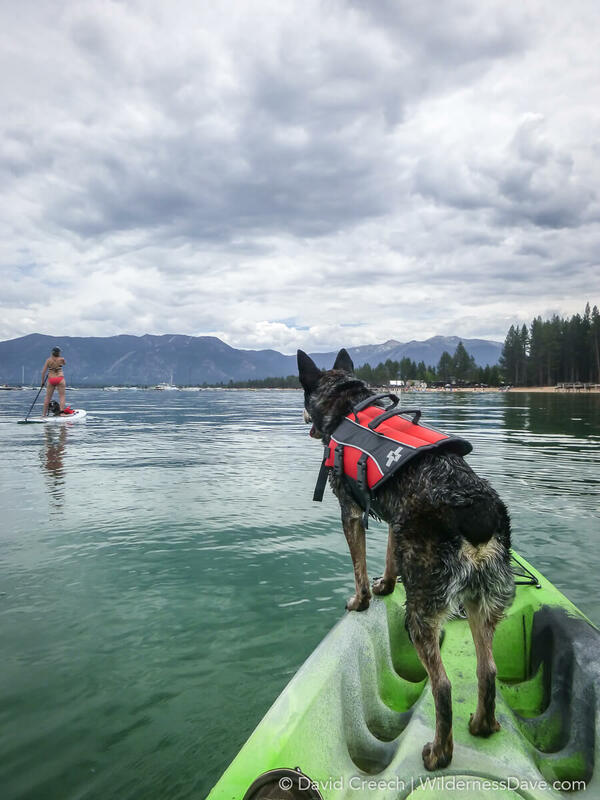 We had a lot of activities planned with the dogs but the big one we were looking forward to was paddleboarding. Last year Wiley proved to be an amazing paddleboard partner and my wife has been obsessed with SUP since. We were dying to get our new guy out on the water and see how he would do. He doesn’t swim well in the pool, but was enthusiastic about swimming in the lake so we got him a life jacket and picked up our rentals. Max was very anxious about paddleboarding at first. He wasn’t sure why we were all separated and wanted to swim between my wife on the paddleboard and me and Wiley in the kayak. This proved difficult until we showed him that we weren’t going to be very far apart. He still fidgeted and paced back and forth anxiously most of the time on the board and did only slightly better in the kayak with me. But we were able to happily spend the better part of an entire day on the lake with small breaks at the shore occasionally for the pups. This also proved to be a lot of adventure for one day and once we made it back to camp, both dogs sacked out next to the campfire for the rest of the evening with little interesting in anything but their dinner. They both have really become great camp dogs and settle in well without the need for restraints or constant commands. It makes traveling and camping with them so much more relaxing for us as well. Our stay in Tahoe at Fallen Leaf Lake was awesome, it’s a great campground and we managed to get a spot that was on the edge so we backed up to forest land and had quiet neighbors. We left Fallen Leaf Lake having (luckily) never encountered the bear they said had been using our camp site as it’s access route from the forest. We headed down into Nevada to visit with some good friends and spend the night there. Finally some other dogs to play with! Running, playing and lots of introductory sniffing before settling down for the night. It was a great visit for dogs and humans alike. The next day we took a new route home after chasing down some more Backcountry food from the local Petco in Carson City. Knowing we had another long drive ahead of us we took our time, made plenty of stops and let the dogs out as often as we could. 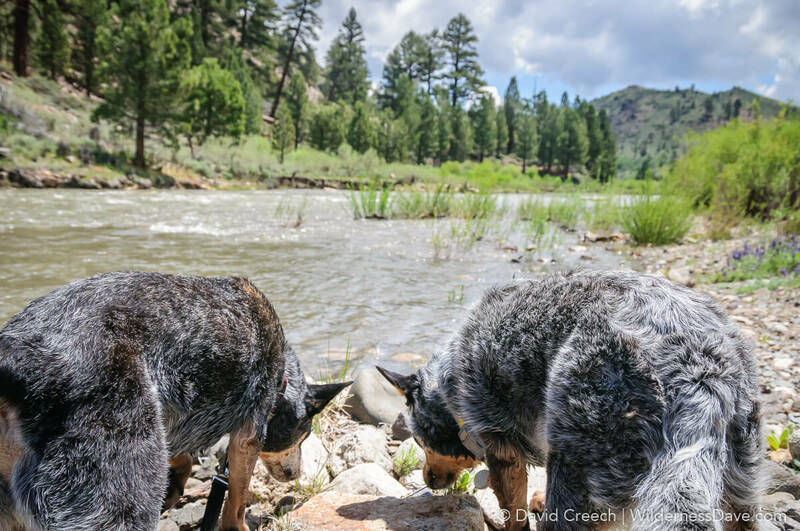 We found a nice quiet road-side river stop off of 395 where we had a good time chasing sticks in the current and digging up river rocks, dunking our heads to pull them up. Lots of action along the river with bugs to chase, water to splash in, sticks floating by and lots of new interesting sniffs. 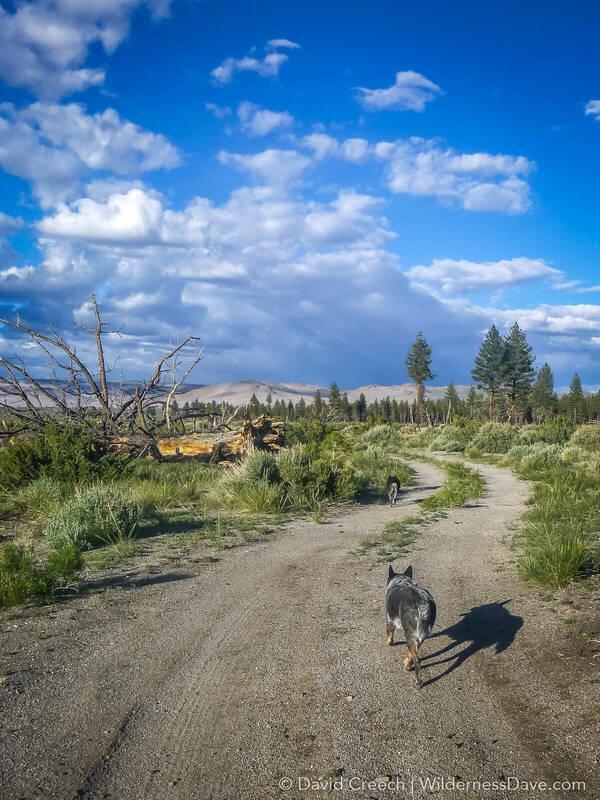 Along the way we explored some back roads in the Inyo National Forest and Max and I hiked to a couple of cool spots while Wiley and Merelyn hung out at the car pouring over maps and discussing our route home. Then we moved on to check out Mammoth Lakes since we were so close and none of us had ever been through that way. I don’t think Max or Wiley had near the level of appreciation we did coming into Mammoth. The lakes are gorgeous and the mountains up there are amazing. 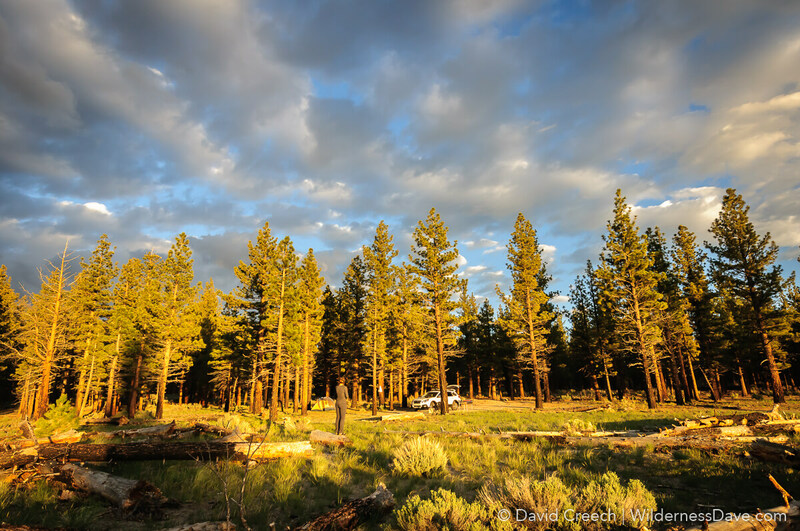 They look to have an extensive, well maintained trail system around Mammoth and a lot of camping options. We’ll have to do our research about how dog friendly it is there, but I could see Mammoth becoming our Lake Tahoe substitute on occasion. We found some great dispersed camping on the way home but heavy summer storms kept us moving through the evening. We finally had to call it quits outside Vegas and rolled into a campsite on Mount Charleston around 11PM. We quickly set up camp in the dark and everyone crashed in the tent, wrapped in our sleeping bags, weary from a very long day on the road. We woke to a very non-desert view of pine trees and granite. Mt Charleston is one of the Sky Islands of the southwest, unusually high with an isolated ecosystem nothing like the desert that surrounds it. Who knew you could spend a night at nearly 10,000 ft surround by high alpine vegetation within an hour of Las Vegas? We returned home to the heat and the city, summer dog adventures were over…for the time being. Max and Wiley were momentarily happy to be home and out of the car for a while where they could harass the cat and cuddle in their comfortable beds. Both dogs slept soundly, beat from a week’s worth of fun in the outdoors and ridiculously long car rides. 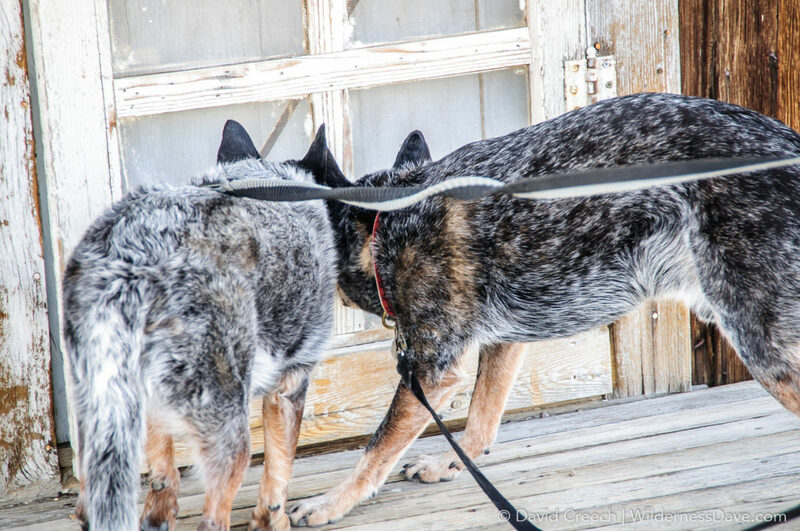 Traveling with our cattledogs brings us a tremendous amount of joy. Even though it limits our vacation options a little and can become a hassle at times, they are so worth the effort and we know they appreciate the time with us as well. 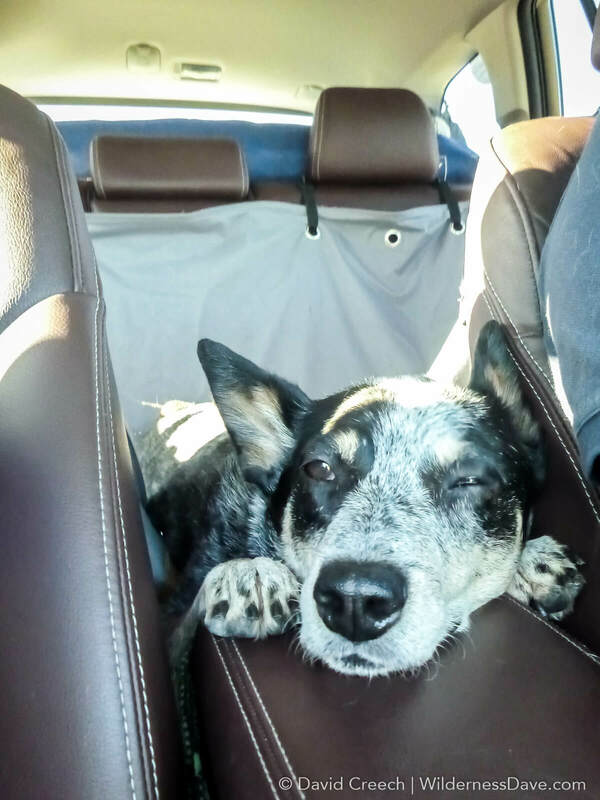 We always expect some recovery time after a trip like this one, so much time in the car you’d think the dogs would be content to sit at home for a while. But the next day both dogs shot outside and jumped in the back seat of the Subaru with that “Where to now?” look on their faces. I guess it’s time to start planning the next trip. 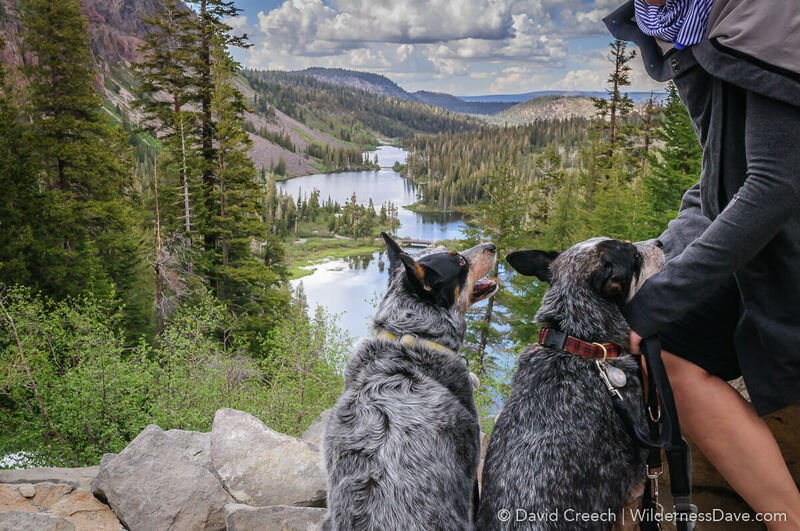 This trip was partially sponsored by Merrick Pet Care as part of their #Wild4Backcountry campaign. 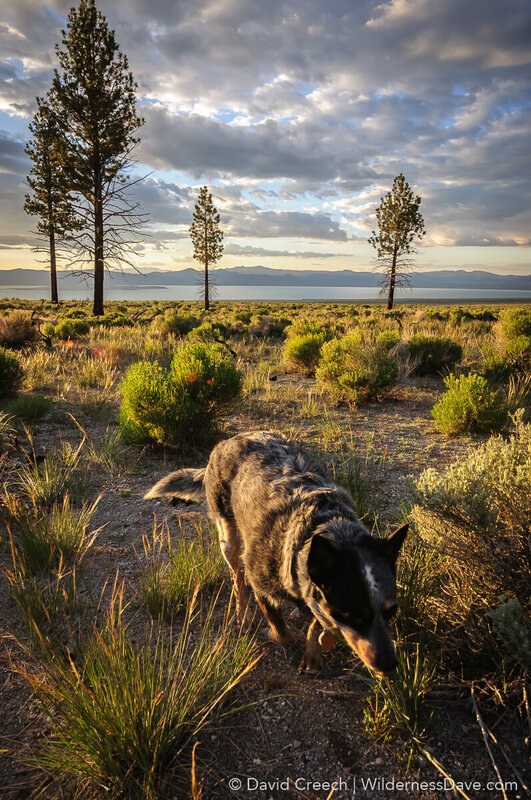 To read more about Merrick’s Backcountry line of dog food, check out our review.